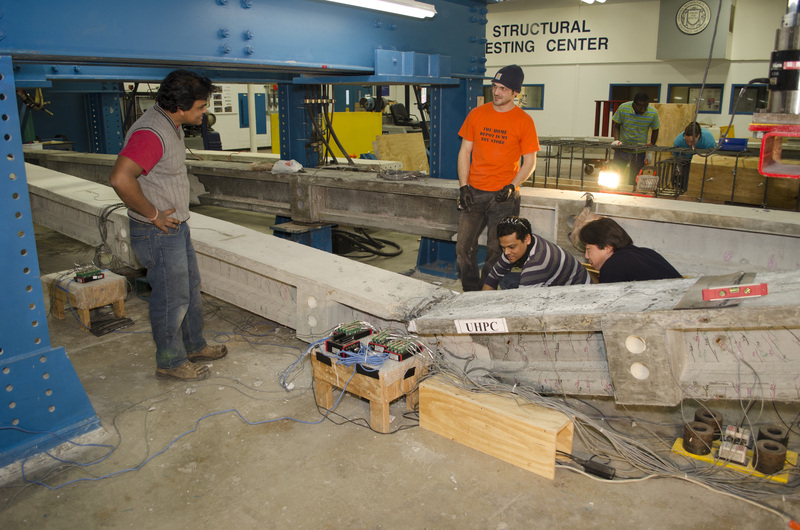 LTU graduate student Ranjit Kumar Sharma (L) conducted the Feb. 5 shear test to determine how much force was needed to break an innovative hybrid bridge beam. LTU’s Dean of Engineering Nabil Grace and his research team are studying alternative materials for the Michigan Department of Transportation and the state transportation agencies of Oregon, Minnesota, Wisconsin and Iowa. LTU was awarded a three-year, $349,000 contract in 2012 through the pooled fund of the Federal Highway Administration to evaluate alternative materials and new approaches to building highway bridges. On Feb. 5, civil engineering researchers at LTU conducted a shear test on a new kind of concrete patented by LaFarge that is considered almost as strong as steel – so strong that the researchers believe rebar stirrups are no longer needed inside the concrete to guard against stresses that can lead to shearing. They tested an innovative hybrid bridge beam made of high-strength concrete in the flexural zone and ultra-high-performance concrete in the shear zone. They found that it took nearly twice as much force – almost 95,000 pounds – to break a beam made with ultra-high-performance concrete without stirrups compared to a beam made with a high-performance concrete with the traditional rebar stirrups currently used. The experimental concrete could also be combined with alternative materials like carbon fiber to replace the traditional steel reinforcement to create bridges that can last 100 years – twice as long as conventional bridges – with much less maintenance. The Lawrence Tech researchers will share their data with MDOT and the agencies from the other four states, and the results could lead to innovations in bridge construction. 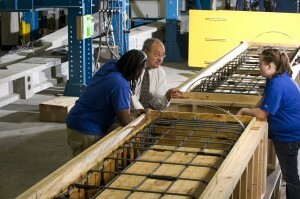 For more than two decades, LTU’s Dean of Engineering Nabil Grace has been researching ways to build longer-lasting highway bridges by replacing steel reinforcement with alternative materials. Lawrence Tech research was behind the construction of first bridge in the United States built with carbon in place of steel in 2001. Numerous sensors placed on the bridge measure the performance under the stresses of heavy traffic in all the climate changes that Michigan has to offer. That field data has been compared to the test results at LTU’s Center for Innovative Materials Research. College of Engineering Dean Nabil Grace discusses preparations for pouring a test beam with researchers at Lawrence Tech’s Structural Testing Center. The accumulated data has convinced the Michigan Department of Transportation to use carbon fiber when replacing three other bridges – over the Southfield Expressway in Detroit in 2011, on M-50 in Jackson in 2012, and on Eight Mile Road in Southfield later this year. The predicted result is a bridge that will last twice as long and require less repair work. “The ultimate goal is to develop and construct a bridge superstructure system with a service life of 100 years with less maintenance and fewer construction projects that tie up traffic,” Grace said.